Mongol Empire stretched across the Near East and Eastern Europe from the thirteenth century to fifteenth century. This is a topic suggestion on Mongol Empire from Paper Masters. Use this topic or order a custom research paper, written exactly how you need it to be. The impact of cultural practices on the quality of life for inhabitants of these countries. This examination will demonstrate that despite many similarities, such as religious tolerance of the Mongol rulers in both regions, the experience of the Mongols in China and Russia were very different for the people of these lands. After the death of Genghis Khan 1227, who had guided the Mongol’s conquests and ruled the empire, the lands were divided among his sons . Ogotai overcame the Chin and Sun dynasties of China in 1234, and another son, Batu, occupied Russia, parts of Hungary, and Georgia and Armenia, establishing the Kipchak Empire, part of which was known as the Golden Horde. Genghis’ grandson Kublai Khan conquered China and used both subjects and foreigners, such as Marco Polo, to administer the empire. 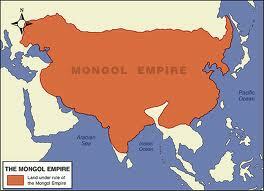 The Mongols lost China in 1367 and Russia in 1380, and the empire was broken into individually governed chiefdoms. During its almost 150-year rule over China and Russia, the Mongols made a significant impact on the lives of inhabitants of both countries. The Mongol’s early reign in China was similar to their rule elsewhere in their Empire. That is, they ruled as military conquerors who intended to enrich their empire, and although the methods that they used to accomplish may have changed over time, superiority and self-enrichment remained the primary concerns of the Mongol rulers in China. Historians have noted problems associated with the appraisal of the impact of Mongol rule on Chinese civilization. Specific contributions of the Mongols to China are well-documented, including the establishment of a rapid postal relay system throughout the country, and the creation of branch secretariats that evolved into the Ming and Ch’ing provinces. However, it is difficult to identify causal links between cultural innovations and Mongol rule. Nevertheless, the Mongol leadership in China eventually created circumstances that allowed for a variety of cultural expression and a relatively high quality of life for the area’s inhabitants. Chinese Nationalism - The importance of sovereignty and independence of action in Chinese foreign policy since 1949 has been closely related to Chinese Nationalism. Qing Dynasty - Qing Dynasty research papers discuss the last imperial dynasty of China, ruling from 1644 to 1912, with a brief return in 1917. Baskaki Administration - Baskaki Administration Research Papers delve into the government system that the Mongols used. Russo-Japanese War - The Russo-Japanese War was the outcome of the territorial expansion of both the Russian and Japanese Empires that brought them into direct conflict over control of the Far East. Russian Revolution - Russian Revolution Research Papers look at this revolution, also called 'Bloody Sunday' as the first serious incident. Catherine The Great And The Russian Nobility - Catherine The Great And The Russian Nobility Research Papers evaluates the relationship between Catherine and nobility. Afghanistan History - Afghanistan History research papers discuss the many changes, wars and invasions Afghanistan has gone through since 1500 B.C. Paper Masters writes custom research papers on Mongol Empire and discusses the changes that occurred during this period.